Pardon me for asking, but could it be that Paul J. Manafort, Junior, the veteran Republican strategist and former national chairman to the presidential campaign of Donald Trump, owns a brownstone in Carroll Gardens? 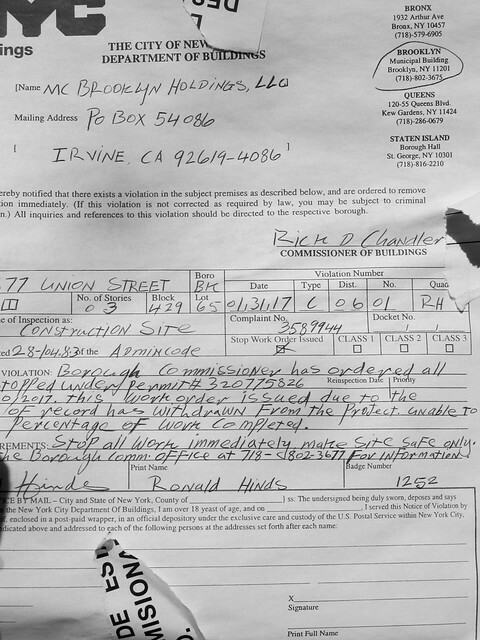 I happened to walk on Union Street between Smith Street and Hoyt Street yesterday afternoon, when I noticed construction debris and several notices taped to the front door of the building at 377 Union Street. "Did you know that Paul Manafort owns a house on this block?" Surprised, I confirmed that we were talking about the same Paul Manafort, one of President Trump's high level advisors, whose name has been mentioned in the news for the past few months and especially in the past several days. Of course I was intrigued. 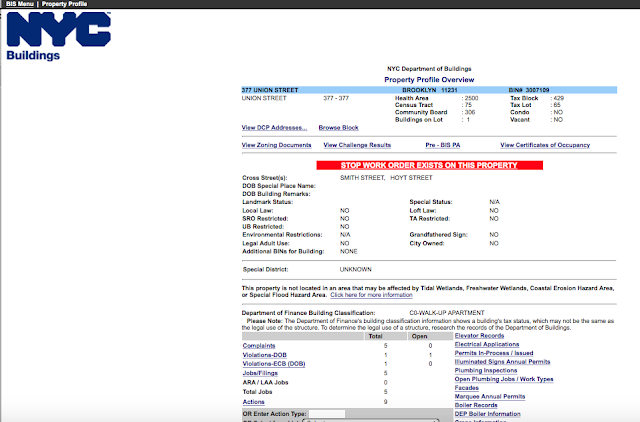 Following the information that I was given, I started looking at public records for the brownstone. 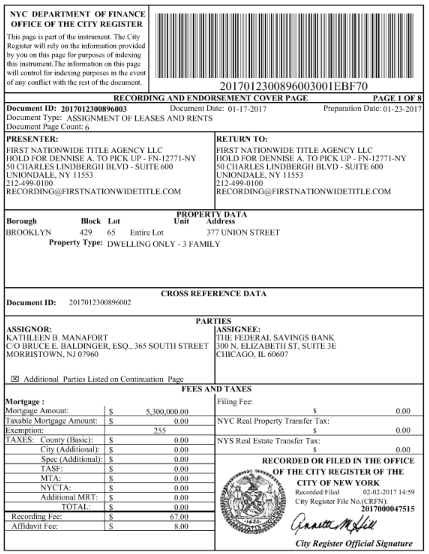 In late 2012, 377 Union Street was sold to MC Brooklyn Holdings, LLC for $2,995,000. 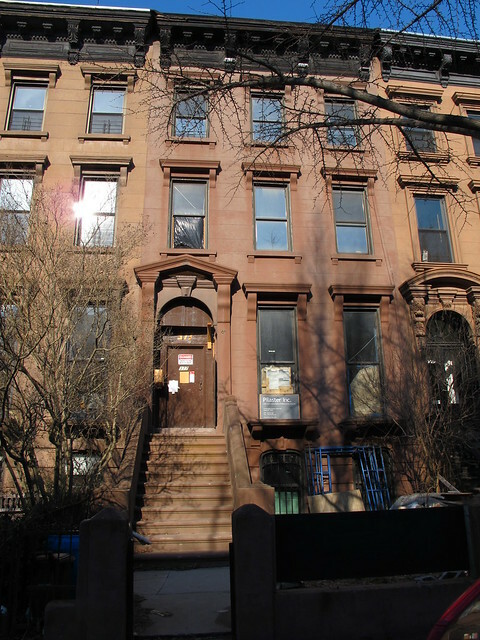 By 2013, the NYC Department Of Buildings approved an application to turn the four story, two family building into a one family home at an estimated cost of $527,900.00. 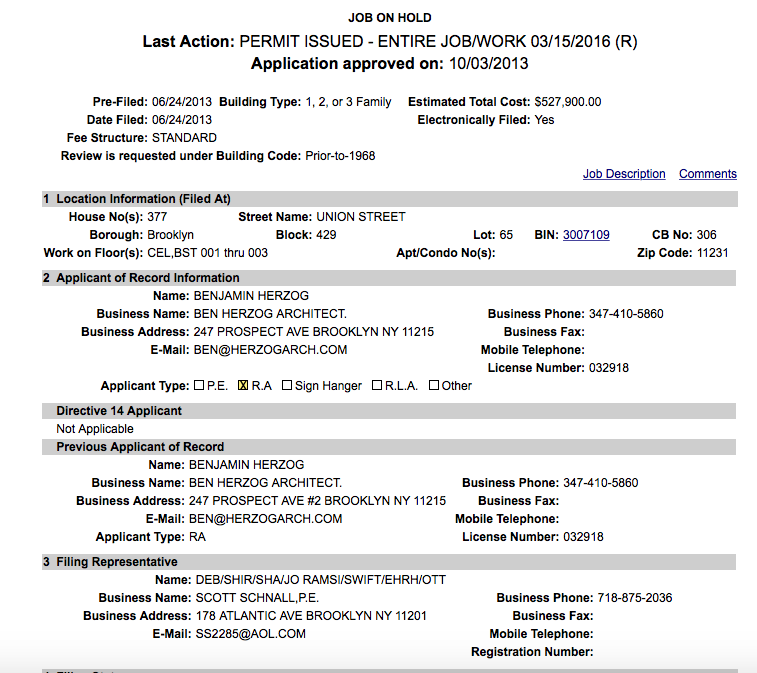 The DoB application lists the owner of 377 Union Street as Paul Manafort. The telephone number on record is registered to Paul J Manafort Jr., 601 N Fairfax St Apt 405, Alexandria, Virginia. Work on the house did begin shortly afterwards, but halted about a year and a half ago. Since then, cinderblocks and rusting steel beams have been stored in the front yard. A full Stop Work order was issued on February 1, 2017 by the DoB Brooklyn Commissioner due to "applicant withdrawal." 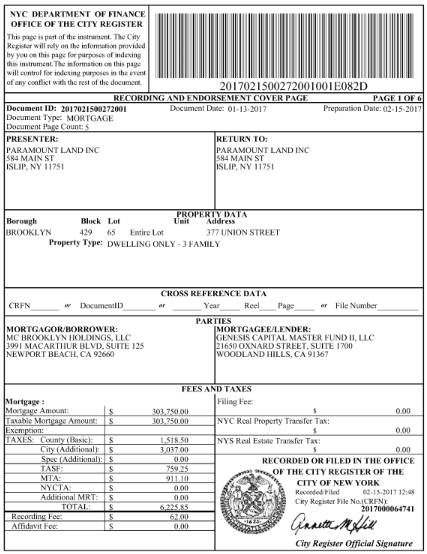 Interestingly enough, according to the New York City Department Of Finance, the deed to the property was transferred from the holding company directly to Mr. Manafort on January 4, 2017. Almost immediately afterwards, it would appear that three mortgages were taken under his name and that of his wife, Kathleen B. Manafort, and under MC Brooklyn Holdings. The Federal Savings Bank prides itself on 'honoring those who have served' and according to its web site, is "owned and operated by veterans with a mission to help serve veterans. Most members of our executive leadership team and many of our employees have also served our country and know from experience that the transition from soldier to civilian means having a place to be able to call 'home'." 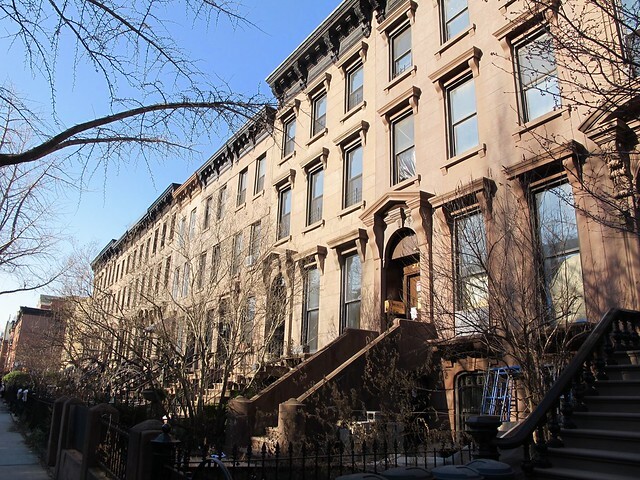 Even with home prices going up tremendously in Carroll Gardens in the past few years, one could say that the mortgage amount of $6,803,750 exceeds the current value of this house, especially in its current condition. Who would have thought that this once solid Italian working class neighborhood would one day attract Hollywood celebrities as well as Washington lobbyists. I don't know what to make of all of this. Maybe one of my readers can interpret these transactions? Well, two attorneys dug a bit further into the records of 377 Union Street and Paul Manafort's many outstanding loans on this property. Julian Russo and Matthew Termine published their well researched findings here: https://377union.atavist.com. It is a fascinating read and seems to confirm that the financial trail appears to be more than unusual. Right after the election I was driving in Bridgehampton and saw him get out of his car on Rt 27. I almost crashed my car. I actually think it's really gross to be doing this. Yes, these are all public records, but you're posting what could be the private residential address and financial transactions of a public figure. For what? It's no different than news blogs posting about how he lives in Trump Tower back before the election or Curbed posting celebrity sales and buys. All of these things are publicly available. You can look up anyone's property tax records in NYC's ACRIS system just by their address. Ugh....there goes the neighborhood, again. there's a balance between the public's right to know and a person's right to privacy. in this case, paul manafort is a public figure who, at the very least, presents a potential security risk to his neighbors because of the people he associates with. to that end, i think that carroll gardeners have a right to know who is living in their midst, not least those who have children. on the other hand, yeah, he is a private citizen with as much right to privacy as any of us, in theory, and i think that sometimes, when information like this is made public, it can be used against that person, which means that it could possibly put that person's safety at risk. to that end, does sharing this information increase the likelihood that activists may arrive at his home to protest his role in american politics? possibly. they have a right to do that. does it increase the likelihood that someone might cause him harm or vandalize his home. yes, i think that is possible, however remote it may be. i think one has to be really careful about how we share this kind of information. is it a public service or is it public shaming? is this man in particular entitled to the same right to privacy as the rest of us? given his conduct as a public figure who is supposed to serve the american tax payers, i'd say no. 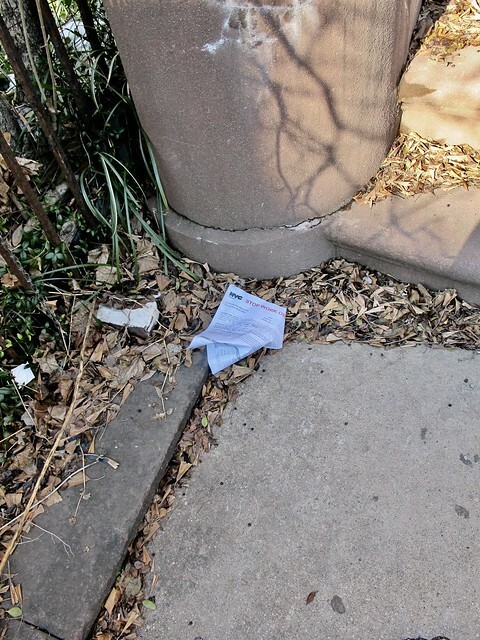 Eff Manafort and ALL the other absentee owners; they have so much $$$ yet can't keep the sidewalks clean or otherwise oversee or maintain their property? If he or a surrogate were THERE to pick up their tickets (the fines should be much higher btw!!) then this wouldn't be an issue, would it? Brilliant work, K, don't heed the fraidycats who don't understand what the PUBLIC RECORD is and should be. Looking at Acris. It appears they have mortgaged 12,000,000. Double what you show here. In each case, the lendee (or LLC, MC HOldings) is a person and not a previous bank, so all of these are new loans and not loans paying down previous loans which you might see if they refinanced. What I find annoying is that YET ANOTHER RICH PERSON is taking a multi-family home and turning it into a single family residence. The population density in this area has gotten too sparse to support everything that made this neighborhood so great. And $12 million? How does that even work? I thought you couldn't get loans that exceeded the value of the property. Mostly because banks don't want to be left with something that won't let them at least break even if not make money. Anon 1;43, thanks for the additional information. That would be an insane amount of mortgage on this house. Wow, that loan is worth almost 700,000,000 rubles! The issue here is that the property is not being maintained and residents are angry. Had he maintained the property then nobody would've bothered even looking up who owns this! Nobody is taking care of the snow removal, nobody is sweeping in front of the property, nobody is maintaining the sidewalk to make sure that it is safe. Also the front yard is full of rust and construction equipment that's been there for at least a year, which is not only unsightly but can also be dangerous. I wonder if he's been planning to move out of Trump Tower into this place? Either way I'm sure Putin will help him repaying those loans. the sale of the Union street house is more convoluted than the labyrinth of the minotaur. It has changed hands three time in as many years-each time the selling price is about $1,000,000 more than the last sale. That the house, in that condition, was approved for a mortgage is fanciful. But each time the seller made a profit. But on paper they have a loss because of the previous mortgage and the depreciation of the property (its condition). the recent owner has a balloon mortgage. What bank would approve this? ?But for new owner he has a house in very bad condition (paper loss) a huge mortgage (another paper loss) and money in his pocket. Of course, he has to pay back the mortgage, but depending on the interest rate, he can come out ahead. he can invest the money (that is probably what he will do) Maybe in some back water like the G.C. Family old timers? Grandfather was an italian immigrant. Spies! A hot bed of Russkie spies! What else could it be?? He was caught receiving 12.7 million dollars in under the table pay-offs from the pro-Russian political party from 2007-2012. This guy has been wheeling and dealing with Trump for years and both are BFF's with convicted ponzi schemers. Their connections go all the back to the Whitewater scandal. Omg. This is amazing. Ha ha ha. I am a neighbor of this buiiding and have praised the contractor for decent workers and good communication. I noticed that the activity had stopped. Figured winter. Figured cement was curing. Local gossip said a CNN anchor had bought the house and was living in my building while it was being built. Ha hahahha. No CNN people here. And the yard is tidy and buttoned down. No one came to remove snow or ice. This article absolutely blows my mind. And the MC Brooklyn office is in Irvine, CA. 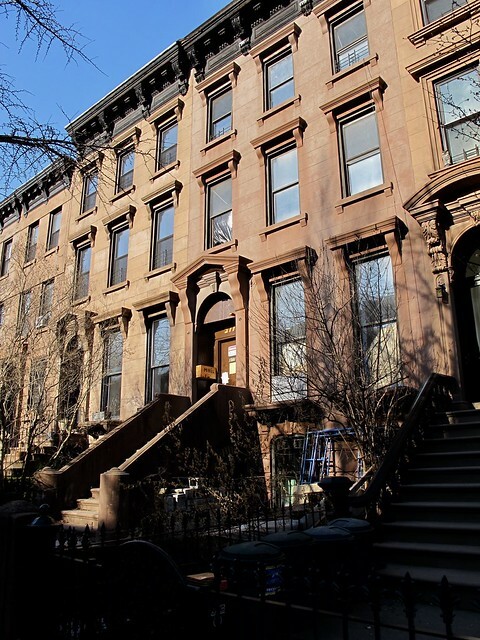 Why target a little old brownstone in Brooklyn for your investments? Perhaps ask the contractor what was planned for this home. BTW this is the house owned by a woman who kept a pig. The pig named Edgar. Whoever suggested your new neighbor worked for CNN may have just trying to be ironic. In the early 90's Manafort was paid by the Pakistani intelligence service, ISI, to do a documentary that would divert attention from Pakistani terrorism. In doing so he posed as a CNN reporter and interviewed Indian Indian officials. Very Tacky. Note: There is also a $300k mortgage recorded by the initial construction lender against fee with the Manafort SPE as the borrower (even though title is no longer held by the Manafort SPE) for 1 yr @ 15%, which is hard money lender rates and strange for this kind of project, and which notes possible intended construction of up to 6 residential units (which would explain the underwriting on the $6.5m construction financing since as a single family home there is no way this would appraise over $9m). Also, I would not be at all surprised if there are some fun things that show up if you google Genesis Capital and Manafort. Since they are filming "The Americans" in the neighborhood, maybe this is the equivalent of a haunted house ride. But instead of ghosts, you get to experience where the Russian spies are holed up. Clearly this is fake news planted by the producers of the show. 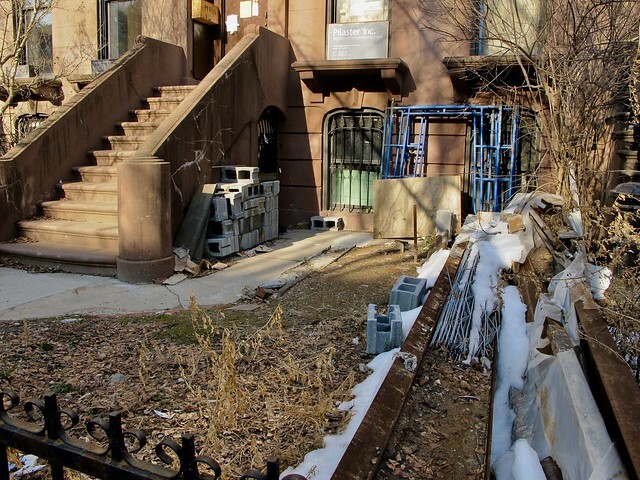 The anonymous commentator who said that the yard of this brownstone is tidy is incorrect. The front yard is full of cinder blocks and rusting beams. The sidewalk in front of this property is not maintained; ice and snow are not removed and the fruit that falls from the female gingko tree, which smells vile, in front of the property is rarely cleaned off. I cannot speak to whether or not the transactions regarding the financing of this property are proper however, this property belongs to someone and should be maintained. Even if the property is an "investment" it is not a share of stock-- it has physical presence in a neighborhood-- and it must be maintained! If the absentee owner cannot do it himself he needs to hire someone to do it. This is a neighborhood! Anon, 10:52, this is great. Thank you for the additional information. Chapter 7 of the Trump Playbook: Manafort pockets the cash, does zero work on the property, depreciates the asset, and then goes bankrupt. The Vetrans loan fund takes a big loss, but Manafort makes nice with a multi-million dollar grant for them from the VA Office. This is they type of thing we need to watch closely and stay vigilant on. Those who willingly propel themselves into the public spotlight, as Manafort has, deserve zero expectation of privacy. I commend Katia for doing solid investigating of public records and highlighting the presence of this scumbag in our midst. We as a community have every right to know all about this. Tidy meaning it is not hazardous. No half built stuff is hanging off and the stop work order has said make safe. The supplies were there when the site was active. The contractor should remove his supplies. That's all. Interesting. $12 million is also the figure that the Ukraine charged Manafort from taking under the table from Putin's Party of Region. Possible money laundering? "The DoB application lists the owner of 377 President Street as Paul Manafort"
Did you mean 377 Union Street? Anyway, terrific sleuthing! I looked at ACRIS last night and my math shows that Manafort has taken out $12.1M in loans on the 377 Union St building in the last 13 months. That's an interesting number insofar as he's been charged by Ukrainian prosectors for having accepted $12M in unreported cash from Putin's "Party of Regions after his puppet, Viktor Yanukovych, fled to Russia ahead of a high treason charge in the Ukraine. Maybe there's a money laundering angle here? Oops. Thanks. Definitely 377 Union Street. As I mentioned before, the finances raise some questions at the very least. That is an awfully high mortgage for a house that is currently uninhabited and has been neglected for the past few years. I am speechless. Amazing work! Thanks for sharing your findings. 40 years ago I got a mortgage on a house in park slope that was in worse condition. Of course I didn't let it sit, but moved in and started work. I sold for about 3 times what I had put into it. And last I looked, which was about 2008 it was worth a lot more than that. @Warner -- Try not to make this about you. Andrea, the best way to contact me is via my email address posted on this site. Thanks. This story has another side which makes it more personal. 377 union St. was our family's beloved home for generations. This is the home where my great-grandparents lived, where my grandparents raised five incredible children. My grandmother was meticulous with it's upkeep. This home is where my cousins and I were taught our family's history through rich storytelling, rich food, and rich imaginations. This is the home whose walls still contain our love and our laughter. This is the home of the Macalusos and Gianquinto's! This story is heartbreaking! Oh, Cathy, i can feel your pain. I remember seeing photos of the brownstone when it was for sale in 2012. It was lovely. Let us hope it will one day be beautiful again. If uou would like to share some of your memories, i would love to speak to you about a post about the previous history of 377 Union. Just email me at the address on the site so we may contact each ither. That's very interesting. Thanks for the link. With all of the "interesting" information that surrounds this particular individual and this property, privacy is not a part of the equation. As many have mentioned, all of the documents Katia posted are a matter of public record. And he is not only a public figure, but in a position which demands a level of ethics above the average citizen. In addition, he has proven to be a terrible property owner and the construction debris is a blight. But the real issue is that there is obvious fraud with his loans for said property. Good for you for sharing this, and I'm glad it's getting picked up by larger outlets. Congrats on breaking the story, Katia! Great work. It took a while for the story to spread, but it sure did. Katia this is awesome investigative journalism!! and REAL news NOT FAKE! And look how everyone is featuring it! Bingo. So commonplace people don't even care these days. "Federal investigators have subpoenaed records related to a $3.5 million mortgage that former Trump campaign manager Paul Manafort took out on his Hamptons home just after leaving the campaign, according to a source familiar with the matter." This one is in Suffolk County, but it seems to be part of the same scheme. It will take some time, but we will learn the truth eventually. At least, I hope. Strange thing is that if any of us normal humans were involved in this many 'deals' & transactions, we would have long ago gone quite crazy trying to keep track of it all - or does Manifort even KNOW what he has going on - how many people does he employ to track it all ? I don't know if having money is worth all this shenanigans ! Well, I am sitting up here in Edmonton, Alberta where it is -16C this morning and reading your blog. Wow, good work !! This age of transparency by way of your ability to go online and research financial records, permits etc., provides for accountability. Who would have thought ( I know I didn't) that one could buy a property for X number of dollars then facilitate the opportunity to wash(launder) money through the property via loans from private individuals who wish to have access to funds from criminal activities. You got to wonder how much Paul Manafort received as a kickback to facilitate these transactions ie: 20% - 30% ??? And does it lead to one wondering just how much influence he had over the election and future policy decisions of the White House. Well done !! Thank you for sharing with the world !! Thanks, Ken. It all is very shady, isn't it? I guess we can hold out hope that if Trump, Kushner and Manafort cannot be bothered to cover up their sloppy and potentially illegal money laundering via real estate they are also not somehow capable of undermining the laws of the United States in a way that will prevent a true Constitutional crisis. I did notice that Mueller did not charge Manafort for a full array of financial crimes, these must be charges that are being saved for NY Attorney General Eric Schneiderman to prosecute. State charges, that are not pardonable by a corrupted President.